Last week I shared what the predicted bathroom trends will be for 2018. 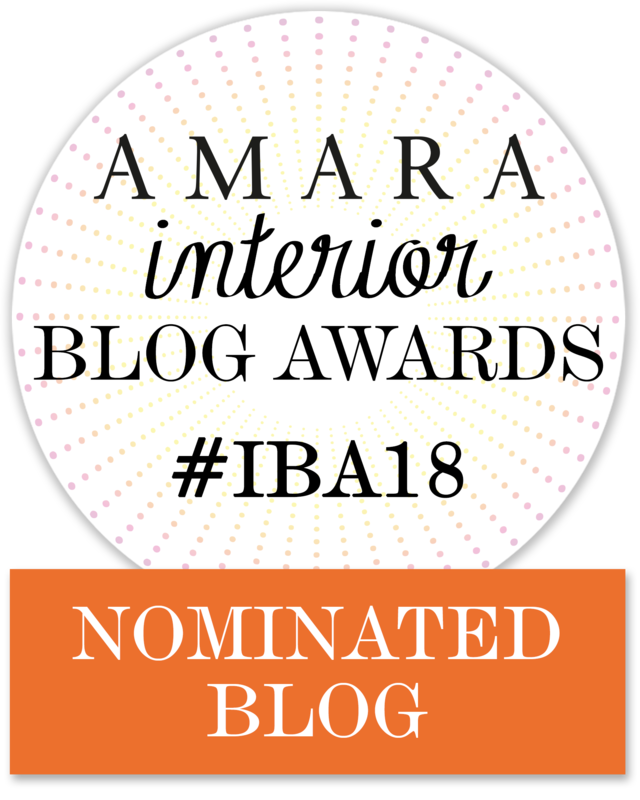 Today’s post is all about the the kitchen trends for 2018. Escapism was the word for bathrooms, but minimalism will still be the best description for kitchens designed from now and into next year. Although, there will be a homely feel added through the clever integration of open shelves and key styling techniques. Cabinetry will be dark and moody. While black and white kitchens will continue to be popular, there will be a shift to using deeper and moodier colours in the kitchen like blues, greens and charcoal with lighter wood grains. 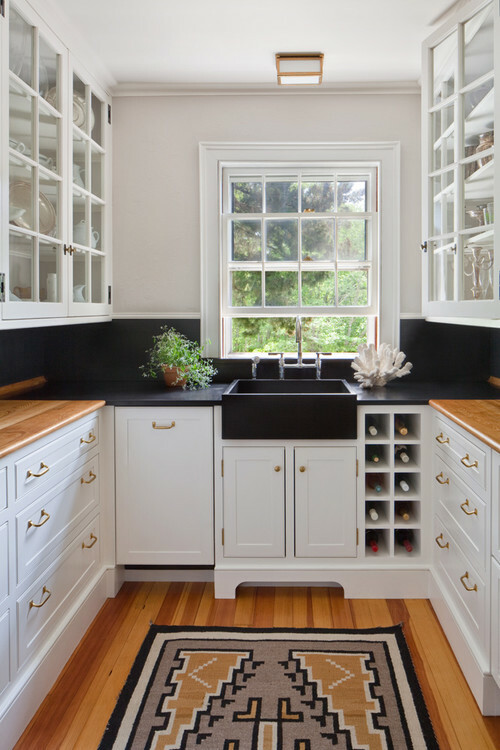 Two-toned cabinets will give home owners a choice of having both dark and light colours in their kitchen. Everything will be hidden behind cabinetry. Fridges, including small appliances like your toaster and kettle, will all be hidden. All will be concealed for a flush and ‘minimalistic’ look. Splashbacks are usually the best place to introduce pattern and colour in the kitchen and we will see more bright patterns and deeper colours used in splashbacks. Think plum and deep purples and blues. Tiles will be hand printed or will have texture. The glass splash back is out. Colour will also be embraced in appliances and kitchen utensils. 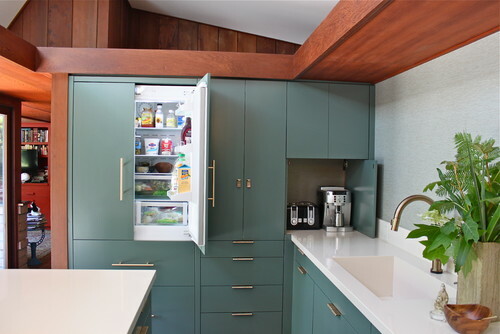 This trend is a bit bizarre if appliances are going to be hidden. 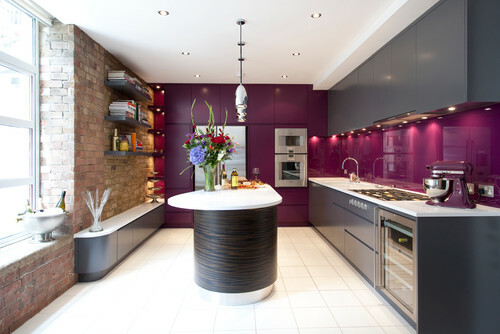 If you choose not to have them concealed, then choosing a bright colour will be trendiest thing you do in your kitchen. It will certainly make a statement. Black sinks are in. The white barn sinks will also be sought for your contemporary country and shaker style kitchens. Sinks with a drainer, are out. The dishwasher is the working horse in the kitchen to keep all clutter off kitchen benches. From a mother’s and plumber’s point of view, having a double sink where the drainer can be included in the second bowl will be practical. Not everything can go in the dishwasher. Filter tap water and soda water appliances will become more popular. While chrome gooseneck spout mixers are a classic choice, many will embrace the different colour options available. Brushed metallics and block coloured taps will be highly sought for the kitchen. Brass tapware will also be popular. 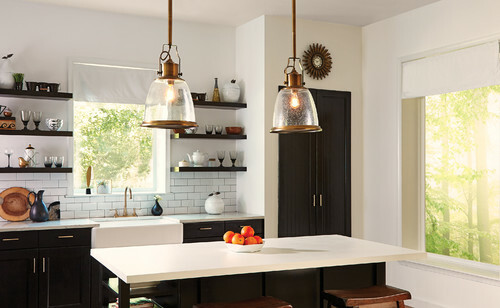 Pendant lights will continue to trend in kitchens for 2018. The lighting will be more subtle with the choice of mimalistic shapes as opposed to the domes we’ve seen in the past over island benches. 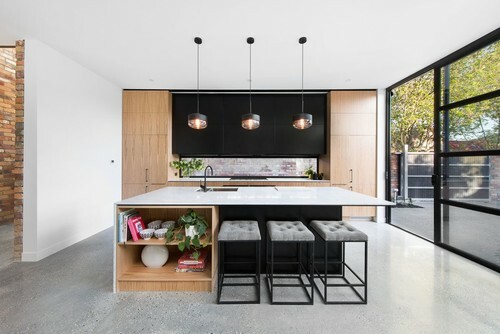 Benchtops will be thinner, with a decline in marble and a resurgence in quartz and ceasarstone. Open timber shelves will not only add more storage space to the kitchen, it will add a homely vibe. Cookbooks, herb pots and utensils can be on display for easy reach and use, in the kitchen. Timber cutting boards will be layered in the kitchen to add texture and a simple focal point on the bench. Herbs and plants that are vine-like will add greenery to the kitchen, giving it an instant fresh update. A kitchen is usually the hub of the home, so incorporating some of the trends, will ensure your kitchen doesn’t date quickly. Always choose colours you know you will love as opposed to ‘what’s on trend’. These kitchen trends for 2018 are predictions, summarized by designers both in Australia and in Europe. 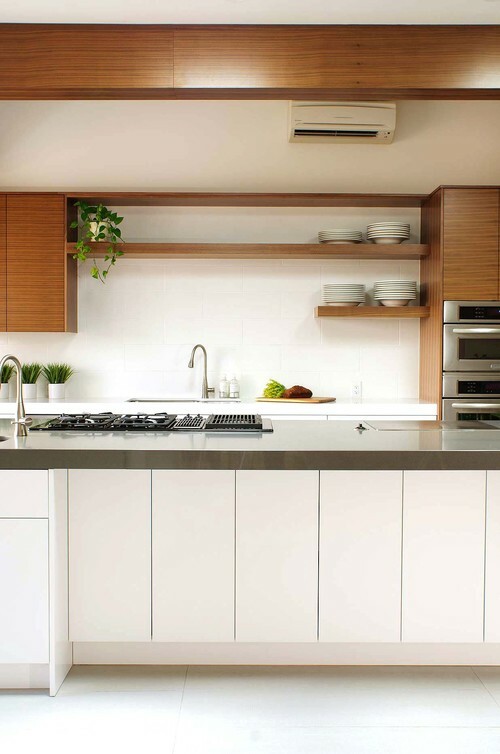 You can use these trends for any planned renovations from now and into the new year. 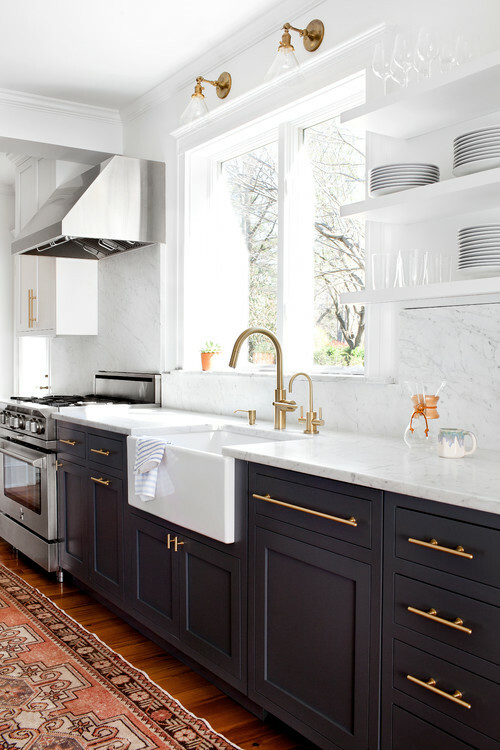 Which kitchen trends are you excited about? 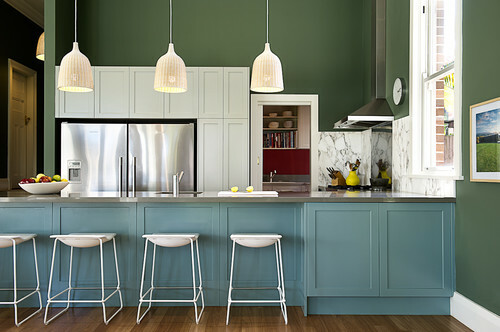 Are you a fan of colour in the kitchen?